Of the 240 traditionally known species of tanagers (Thraupidae) 143 inhabit the country of Ecuador. Within this heading are included the tanagers, honeycreepers, conebills, flowerpiercers, dacnis, euphonias, bananaquit and plushcap. These avian species are found only in the Americas, the vast majority located in the neo-tropics: Central and South America. 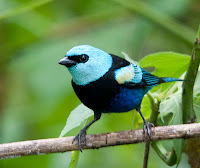 Tanagers can vary greatly in length from the diminutive Short-billed Honeycreeper and White-vented Euphonia at 9.5 cm (3 ¾ inches) to the mammoth Magpie Tanager at 28 cm (11 in.). Although there are many species that are dull in color, most display a rainbow of hues and shades and are among some of the most radiant of the rainforest inhabitants. Bills can vary widely from the slender, decurved mandibles of the honeycreepers to the solidly built bills of the Silver-beaked and Lemon-rumped tanagers. Some species show significant difference in color between the sexes while others are barely discernible. The majority of the tanagers are arboreal, hiding amongst the trees and bushes in heavily wooded areas. However, there are a few species that occur in lower forest growth and in semi-open areas. While some tanagers can produce a beautiful and melodious sound most, unfortunately, do not. Tanagers are omnivorous in their diet eating everything from fruits and nectar to insects, depending on genus. 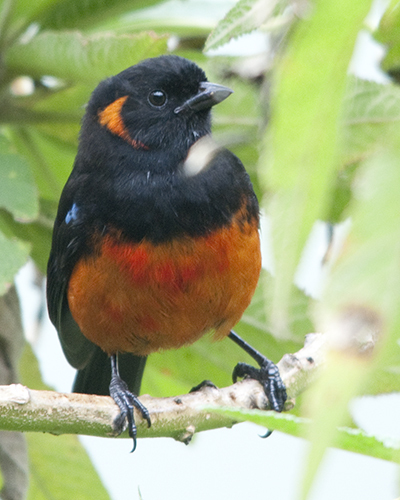 The normal breeding season for tanagers in Ecuador is September through October. There is not much information about whether they are monogamous or polygamous in their mating habits. The males will show off their colors and sometimes go through ritual dances to attract a mate. Tanagers are the showboats of the Ecuadorian rainforest, flaunting their dazzling colors in an array of splendor. Be observant as you travel and you will experience an incredible diversity of brilliance and grandeur. Pamela from Hubpages here. This is a great blog you have, Colibri! Your writing amazes me, too. I have a long ways to go. Yours is very professional. We are in the middle of deciding whether to move to Arizona where our daughter and her family are living. There are beautiful birds there. Due to the terrible heat, there is something quite unique there. It is a whole community of interconnected 'rehabbers' as they call themselves. People who have learned how to care for and rescue injured birds or baby birds that the mother isn't coming back to feed. There is training and licensing. Do they have that kind of thing in Ecuador? I imagine there's not much need for it as the birds have their forest like they should have. In Arizona there is just desert and houses, desert and houses. Great blog. Great life you have. Lucky you in Ecuador, retired.